If you have been around the making money online scene for even a short amount of time you would have heard this term. But what money is in the list? Actually what even is this list? Is it important for your success? How do you get this list and what exactly should you be doing with it once you have it? All your questions will be answered in the following blog so read on my friends. The list everyone is referring to is the database of email addresses you have accumulated and represents potential customers that you can market too. 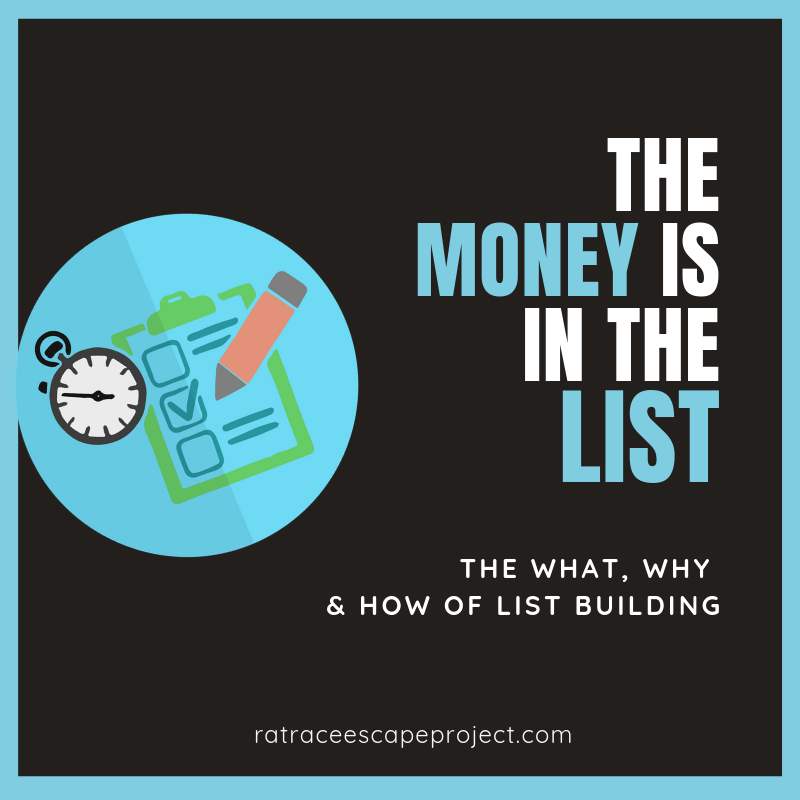 “The List” is indeed a powerful tool for an affiliate marketer to have in their possession and is worth putting some effort into sourcing. I believe setting up an email capture system early in the life of your site is crucial to your long term success; and even better it doesn’t need to cost you a cent to do so. While your site is still young and may not have a bucket load of traffic you can still have your email capture system set up. Even one email address is better than none and everyone had to start somewhere. You can get it set up for free so there is no capital outlay to get started. How Do You Get The List? Can’t I Just B​​​​uy A List? Purchasing an email list is not only illegal but it is unethical. Yes I know you can find places online to buy these lists and I strongly discourage you from going down that slippery slope. These are random emails, probably gotten unethically and many of which will not even be valid. So you are buying a list of rubbish to start with. But worse than that these unsuspecting people probably have no interest whatsoever in what you are talking about. Do you really want to be wasting your time on stone cold prospects? And having your emails considered as spam! To me this is the same as the telemarketer calling me in the middle of dinner with offers for products I don’t want and have probably never heard of! Permission based marketing on the other hand is worth working towards. This is where you directly source people interested in your topic and have them freely provide their email address to you, they give you permission to communicate with them. Now when I say freely you may have to entice them with an offer - often called a lead magnet. You have probably seen hundreds of these in your time trawling the internet. Chances are if you look to the top of this screen you will see my email opt-in offering a free How To Affiliate Marketing Guide in exchange for your email address. This is a lead magnet. Once you have built trust with your audience, by then offering them something of value and that they actually want, they are more likely to give you their email. Videos - these can be educational videos offering training relevant to your site, live product reviews including unboxing of products, how to use the product etc. or screencast productions of interesting software. Video is a fast growing medium and is very popular at the moment. Discounts and Coupons - many affiliate programs will offer discounts which you can pass on to your readers and using an opt-in form is one way to leverage the discount or bonus. Software - if you aren’t a software developer (neither am I) have no fear there are private label rights (PLR) software you can buy and use as freebies on your site. These are usually small downloadable programs that offer a simple fix and can be anything from keyword checkers, SEO optimisers, wordpress plugins etc..This software does often need to be purchased but the smaller offers are usually around the $5 - $10 mark and once you have purchased it you have it forever to do with as you wish. eBooks, Reports or Guides - offering a substantial product like a 100 page eBook may influence some people to give you their email. On the other hand some people don’t want to spend an age reading something and would rather have a concise report or guide that condenses it into bite size chunks. A lot of what you offer on your site will be trial and error and you will need to play with a few different offers over time and see what works best for your audience. Many of the offers such as eBooks, reports, guides and software can all be purchased as Private Label Rights. This in essence means you have purchased the product to use commercially, often you can edit it and you can legally pass it on as your own work either for free or for sale. Obviously this saves you time and angst because you don’t have to write it yourself and you can get an offer out there quick smart. A word of warning through - check the fine print for every product you are considering purchasing. Some may not be able to be edited, some may be able to be given away but not sold, some you may be able to change the cover or format but not edit or change the content. You need to fully understand any restrictions on the product before you part with your cash. Also there are more reputable PLR resellers than others. Check the quality of the product you are interested in. If you have to completely re-write a report is it really worth paying for it in the first place? Some of the products are fantastic and just by adding your name to a nice fresh cover you have a usable product ready to offer on your site, unfortunately they are not all like that. Having said all that if you have the skill and time to write your own then nothing beats that. It will be a one of a kind and not something that has been sold and shopped all over the internet as many of the really good ones have. An opt-in can be as simple as a neat little widget in your sidebar offering to send your weekly blog round up in exchange for an email address. If you have a strong fan base many of them will appreciate being advised once a week of new content on your site. These people like what you offer and want to be kept up to date with new happening on your site. These people who have a genuine appreciation for your content often don’t need a lead magnet or freebie to entice them to sign up. As discussed above these will be an offer in exchange for the email address. There are multiple ways you can set these up on your sites depending on what is available to you through your theme or various plugins. I am using a ribbon across the top of each page or post on my site. This is a two-step opt-in. Two-Step Opt-In? What the Heck Is that? I prefer the 2 step opt-in which is basically a two click process for the subscriber. Initially they click on the link and then a second pop up box with a form appears where they add their email address. Depending on the format of your second pop-up this gives you the opportunity to elaborate on your offer and also to explain if they can expect further communication from you. An example of this might be for the pop up form to say Thank you for requesting our Guide, this will be emailed to you immediately. We will also send you our Top 3 Tips on … … … … … over the next three days direct to your inbox. This way your reader is expecting your next three emails and has agreed to receive them by continuing with the opt-in and giving you their email address. Let's try a demo shall we? No you are not about to get tricked into buying something or signing up to something you don't want! There is a heap of psychology around why using a two-step opt-in is better but suffice to say it’s all around reducing the amount of perceived effort the subscriber experiences to sign up. Clicking on the link is easy and they are not anticipating having to fill in a form, but when it is there and the benefits are explained they will usually follow through. The subscriber has shown an increased commitment to the process by undertaking the two step process so you build a more genuine and committed list. There is also the one step opt-in which I don’t recommend. So as soon as they submit their email address and click on the link they are taken straight to the freebie or it is emailed direct to their inbox. There is no second step. As I said I don’t recommend this option because your subscriber has shown no real commitment to the process and they are more likely to get the freebie and then unsubscribe to your very first email. I suggest setting up different opt-ins depending on what you wish to do with your subscribers. This also gives you some data to see where on your site opt-ins work best. One word of warning through don’t go completely mad and have them all over every page and thrown in willy nilly at every opportunity for a pop up. 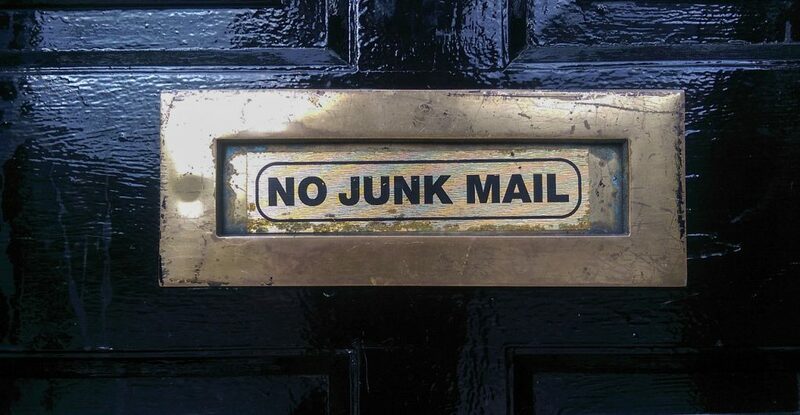 If you offer a weekly blog email then don’t send them your Guide. They didn’t ask for it and this could be considered spam. They signed up for your weekly blogs so give them your weekly blogs. Within your blogs you will have affiliate links to various products, you will do product reviews, each blog will offer value but may also make a suggestion for an offer that your subscriber maybe interested in. This is enough sales material to be providing to your subscriber. Don’t then send an email completely out of the blue with a one time only, super limited, extra special bonus offer. It’s just spammy and people these days are too savvy to fall for that sort of rubbish. When you collect emails for a freebie you should state clearly that they are getting your FREEBIE when they sign up for your newsletter. This gives you permission to continue to use their email address for further contact as time goes on. 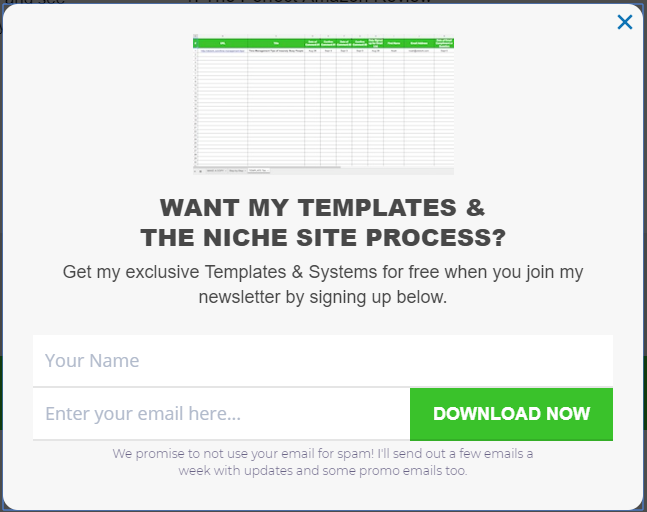 See the email sign up form from Niche Site Project - this is how it’s done. Doug clearly let's his audience know what is going to happen now and into the future if they sign up and provide their email. Nothing spammy here. So who actually collects “the list” with all these email addresses? You need an email autoresponder which is provided by an outside company. They collect and store the email addresses as well as sending the required emails direct to your list as and when you stipulate. There are many free and paid email responders available. I am currently using the free version of MailerLite. They seemed to have the easiest to use system, I can send up to 12,000 emails per month and I can collect 1000 subscribers (email addresses) before I have to upgrade to the paid version. There has been some negative feedback about MailChimp deleting accounts of affiliate marketers and MLM home based businesses without warning. Apparently MailChimp may consider some of these businesses as sending spam which is against their terms and conditions and without warning your beloved list could be gone. Check out this video which explains what you can and can’t do if you go with MailChimp as your autoresponder. I personally wasn’t prepared to take the chance of in inadvertently breaching Mail Chimps Terms of Service and losing my list so I have chosen MailerLite. Once my list has grown to meet the 1000 subscriber threshold I will look more thoroughly into whether to stay with MailerLite or move to Aweber as a paid option. By this time the list should be making money so paying for an autoresponder to keep growing the list shouldn't be a big deal. I only found Send Pulse after I had signed up to MailerLite and they do look pretty good so I would recommend you do some homework with them as they may be another great free option. You need to integrate your chosen autoresponder into your website and set up the opt-in forms as discussed above. Each company is a little different and they are all worthy of articles within themselves so I won’t go into detail on how to use each one here. Once you are set up then the list collection begins! What Do You Do With The List Once You Have One? Treat your subscribers with the respect they deserve. Behind every email address is a real person. Your aim should be to build a relationship with that person and to develop genuine rapport with them. You are able to go on helping that person long after they have downloaded your freebie, signed up to your blogs and left your web page. “You will get all you want in life, if you help enough other people get what they want.” - Zig Ziglar. As I said above don’t spam your list! It takes a lot of work to build a list and only one click from a subscriber once you have done the wrong thing and they are gone for good. Of course this is also an opportunity to turn your subscribers into customers but this will not happen if you do not provide value first, and help them get what they want, and if you spam your list. The figure which is touted as a good conversion rate is $1 per subscriber per month. So if you have 1000 subscribers you could expect $1000 per month. Seems a little random for my liking but I suppose it gives you some idea as a starting figure. By only sending promotions or affiliate offers in every email or by sending mass amounts of emails with no value you will end up with unsubscribers and then you don’t have a list. It is the same with everything we do as affiliate marketers You must provide value first - sell second. So by all means keep in touch with your subscribers, do what you told them you would do, use your list to provide value to them and by doing so they may just turn into customers. Have you started your list? How is it going? If you haven't started your list are there any questions I can help you with so you can get going on building your list? Drop your thoughts in the comment box below and we can have a chat. Remember "The Money Is In The List".